16 pages of full-color photographs that show positive changes from birth to 3 years. 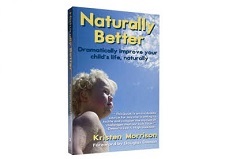 Kristen Morrison relates the journey she took to change her child’s future. In addressing the challenges her child faced, she discovered resources that any parent can use to help a child achieve his or her full potential. This book proves that parents really can make a difference. Home-based therapies beneficial for ADHD, Autism, Cerebral Palsy, Down syndrome, etc.